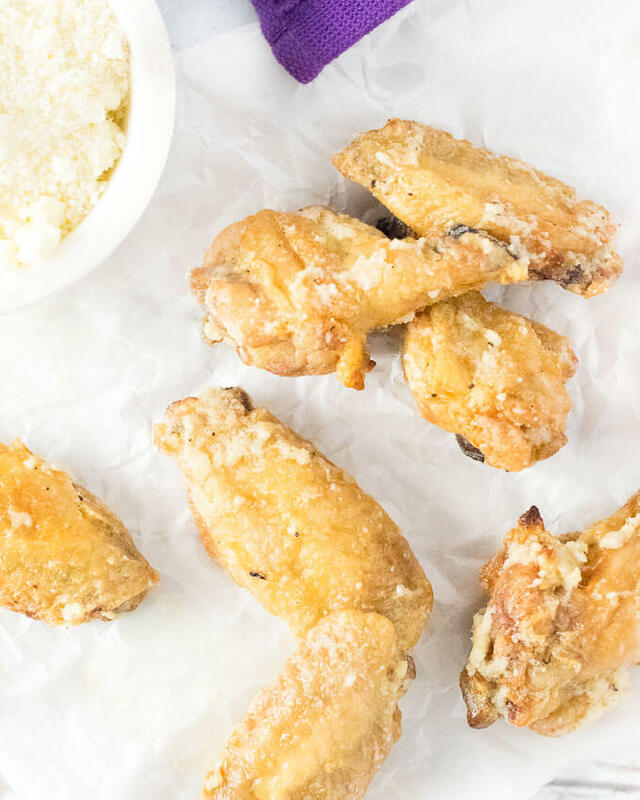 Garlic infused butter mixed with freshly grated Parmesan cheese coats each crispy bite of these baked Garlic-Parmesan Chicken Wings. If you have never baked chicken wings at home. You are missing out. When properly cooked, baked chicken wings are every bit as delicious as their fried counterparts, but they are much simpler to prepare. Speaking of easy to prepare. I am going to share a prepping secret with you that will rock your culinary world! 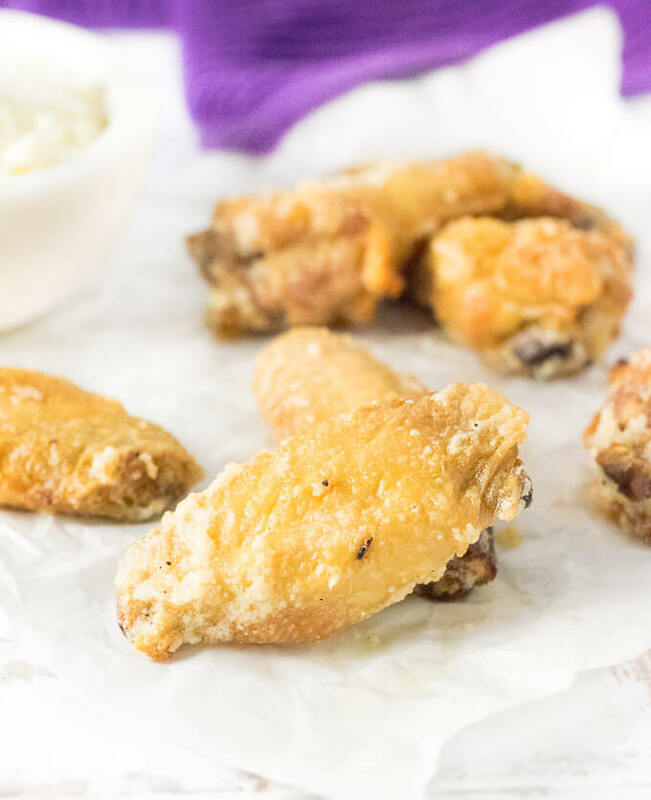 Most Garlic-Parmesan Wing Sauce recipes online call for using garlic powder rather than real garlic. The thinking for this is because big chunks of garlic won’t disperse evenly to coat the wings, even when carefully minced. They end up sacrificing flavor for efficiency, which sometimes makes sense. However, this is not a necessary compromise. 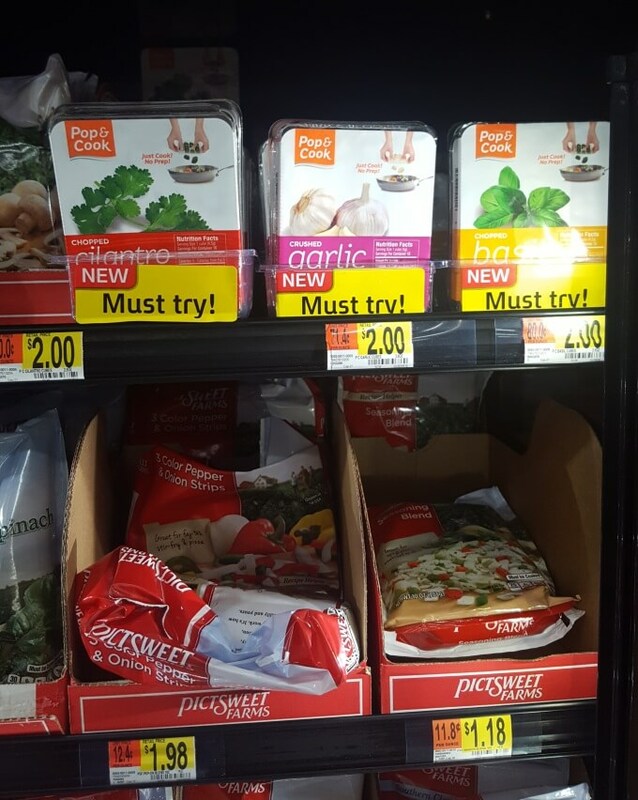 Recently at Walmart I discovered Pop & Cook Crushed Garlic in the frozen food section! What is so darn exciting about this? Well, they are already pre-portioned in clove sizes making it easy to use in recipes, plus they are already crushed into extra-fine bits. There is literally zero prep, you just pop them into your pot or pan! 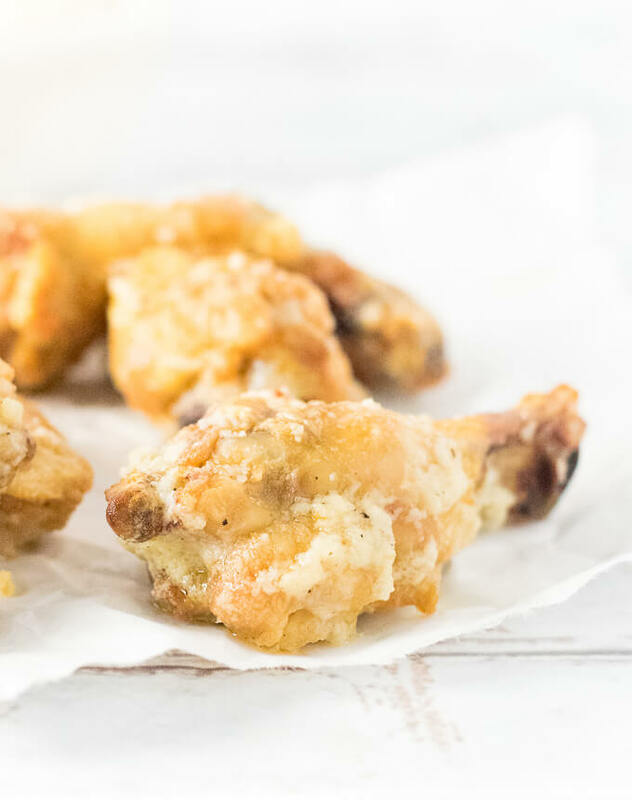 Why am I so excited about Pop & Cook Crushed Garlic for this Garlic-Parmesan Chicken Wings recipe? The crushed garlic is already the perfect size to incorporate into the wing sauce, ensuring each wing will be perfectly coated with garlic. There is no need to worry about large chunks of garlic causing uneven distribution, or sacrificing flavor by using garlic powder instead! 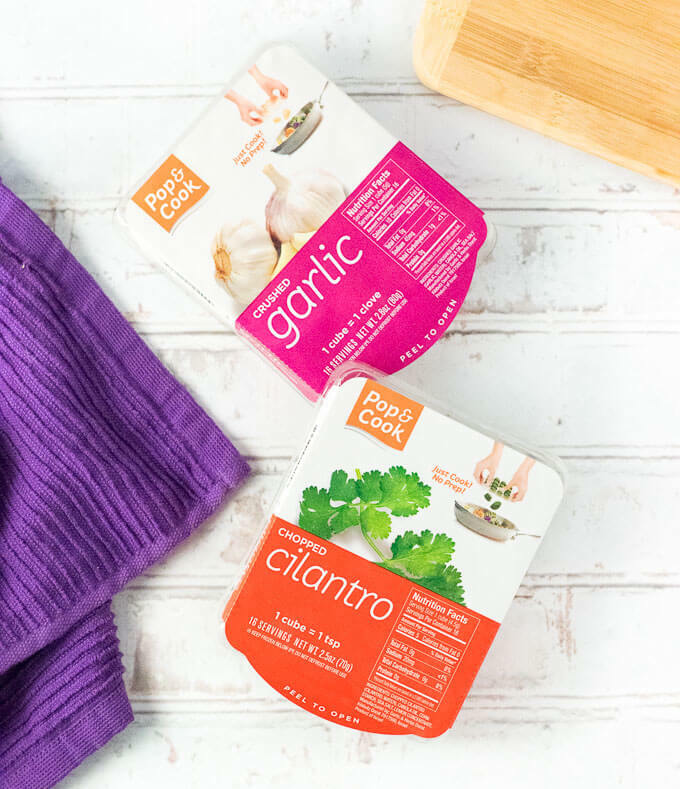 Pop & Cook as more than just Garlic. Next time you are at Walmart check out their other options including cilantro, basil, ginger and glazed onions! All of their ingredients are flash frozen within 90 minutes of harvest to ensure peak freshness. Place the wings, uncovered, in the refrigerator for a few hours to dry out the skin. Place wire rack on a baking sheet and lightly coat the rack with oil. Using a large bowl, add the baking powder, salt and chicken. Toss to evenly coat. Spread wings evenly on the baking tray with room for air to circulate, skin side up. Bake on the lower rack for 30 minutes. Move to upper-middle rack and bake at 425 degrees for 50 minutes. Rotate the tray halfway through for even cooking. Remove from oven and let cool for 5 minutes then toss in Garlic-Parmesan Sauce. Add crushed garlic and butter to a small saucepan and gently heat until butter is melted being careful not to brown butter. Remove from heat, add remaining ingredients to garlic butter mixture and stir to combine. Pour sauce on top of cooked wings and toss to evenly coat. IF YOU LIKED THIS RECIPE you will love my Honey Hoisen Asian Wing Sauce too! 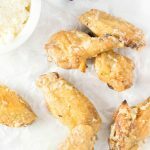 If you enjoyed reading my Garlic-Parmesan Chicken Wings recipe then you should probably like me on Facebook and follow me on Pinterest too. That’s what I would do at least, because if you don’t get to know me but you still use my recipe it is kind of like taking candy from a stranger, and your mom taught you not to do that. Don’t disobey your mom, subscribe to Fox Valley Foodie today. These look really tasty and easy to make!! These look really good. How would you change it to make nit a dinner entree with chicken breasts such as changing the cooking times, etc.? PS Your French Onion Pot Roast is amazingly AWESOME! First time made it without the carrots as you suggested, but since have added them.